Iceland is a small nation and our hearts beat for football. As a football player in Iceland, you get used to playing football in all kinds of weather. Every footballer here has experienced a practice where the wind is so heavy that the goals won’t stay put, or the weather is so freezing that it literally hurts every time you hit the ball. It’s for sure a bit crazy to play football on this tiny island in the middle of the North Atlantic but it doesn’t matter, people love the sport and today it is the most popular sport in Iceland. Since we can experience some crazy weather here we have the football season in the summer; the only time of the year when the grass is green enough and the fields good enough to be called football fields. Although some of the big towns have built indoor football fields for the teams to practice on over the winter time, still today most of the teams practice outside in all kinds of weather and that’s where you can really see the viking spirit! Over the past few years both our women’s and men’s teams have grown a lot. 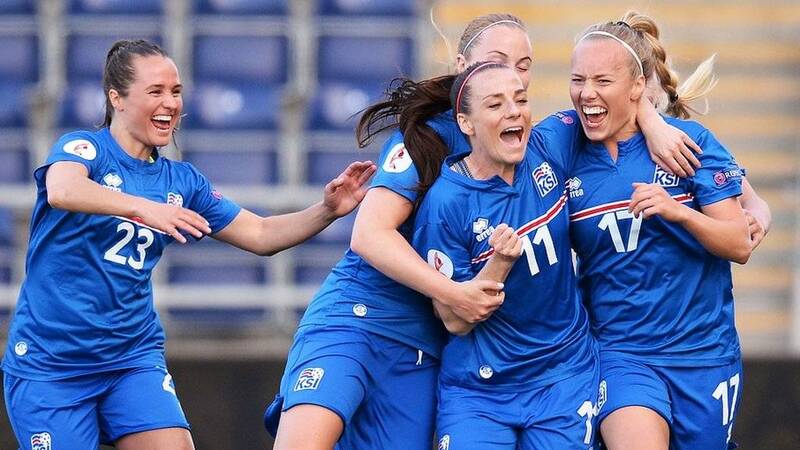 It is remarkable for a nation with 350.000 inhabitants to have a women’s national football team that qualified for the Euros three times in a row, 2009. 2013 and 2017, making it to the Quarter Finals in 2013. And a men’s national football team that qualified for the Euros in 2016, advancing to the Quarter Finals as well, and are now going to the World Cup in 2018! On June 16th, in just twelve short days, Iceland’s first game in the World Cup against Argentina will take place in Moscow. I can tell you for sure that the Icelandic nation has long saved the date. So buckle up and get ready for the World Cup in Russia this summer!